I may be a PC but i still sad. 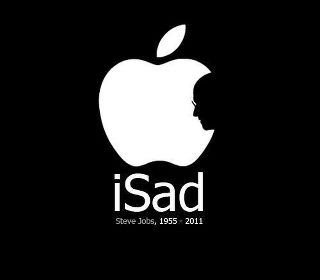 I hope Steve Jobs realizes the amazing mark he left on us... and on our world..even just for the sparking of the competition and the making of my own pc better! Condolences to all of you Apples, Macs, i's of all kinds and the entire Job families. *logo above one of the many now being designed and used by fans of Steve Jobs. That quote is amazing!!! I am so glad you shared that. It is changing how I feel about today. As I have read through many of the tributes to Steve Jobs, it is clear that he greeted each day with determination & purpose. We could all learn that lesson. That quote is so moving. Thanks for sharing, Michele. Steve Jobs changed the world. That's a hell of an achievement. Thanks for that quote, Michele. He certainly lived what he spoke! I hadn't heard this particular part of that commencement speech. Or if I had, I don't remember it as well as I will for having read it. Thanks for taking the time and making the effort to share it with the rest of us. I think I need to copy part of it out where I can see it every day. That is a great quote - great inspiration and way to choose a path. He will be missed.